Is it too much to have wedding desserts and a wedding cake too? This isn’t the first time we’ve heard this question asked by couples planning a wedding in New Jersey, yet our answer remains the same – no. You can never have too many desserts at a wedding. Just about everyone can’t resist delicious sweet treats, and having a variety gives cake lovers and beyond, something to choose from. If you’re not sure what kinds of desserts you should serve at your wedding reception, these pictures should give you some ideas. 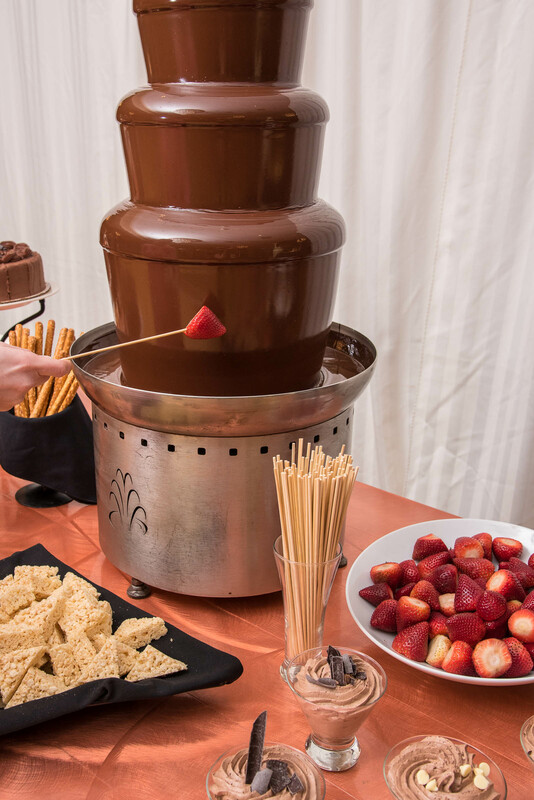 As your guests finish dinner at the Windsor Ballroom reception hall in New Jersey, give them a dessert station to blow their minds. The Chocolate Lover’s Paradise is the perfect pairing of chocolate, chocolate, and more chocolate. Decadent chocolate layer cake, fudge brownies and hand-pipped chocolate mousse surround the centerpiece of the table: an avalanche of velvety chocolate flowing through a heated fountain with everything you can imagine for dipping. Ask about adding this special station to your wedding package. Who says that desserts have to be eaten standing still? Give your guests bite-sized treats to keep them dancing all night long. The Dessert Hors d’oeuvres are passed on silver trays by servers during dessert. 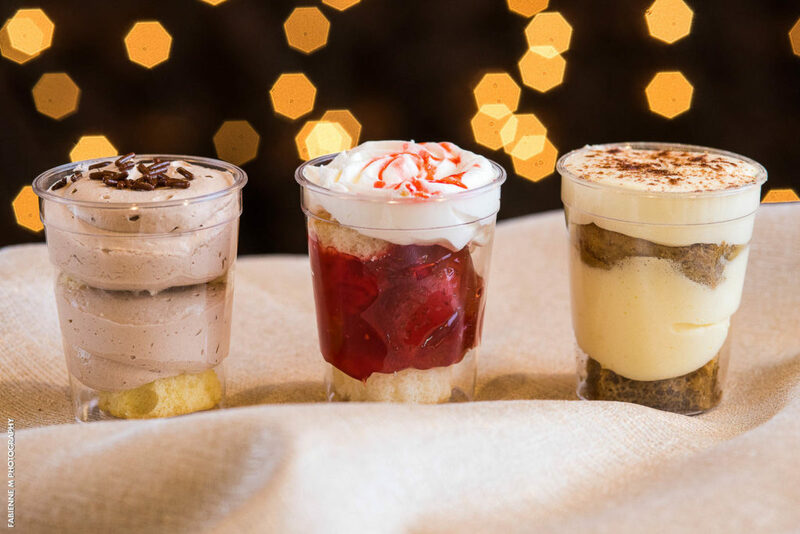 Guests rave about the mini donuts and milk as well as the parfait shooters which include strawberry shortcake, tiramisu, and s’mores flavors. Ask about how you can add the crowd-pleasing Dessert Hors d’oeuvres to your wedding or mitzvah package. For the non-traditional bride and groom, choose an all-time favorite sweet snack like freshly dipped donuts! At the Windsor Ballroom, we just added our new Donut Mind If I Do station to our growing list of menu options. Your guests will choose either plain or chocolate donuts and a server will dip the donut in the guest’s choice of vanilla icing, chocolate icing, or classic glaze. An array of colorful toppings including sprinkles, mini marshmallows, M&M’s, and more, make for a special, personalized treat. 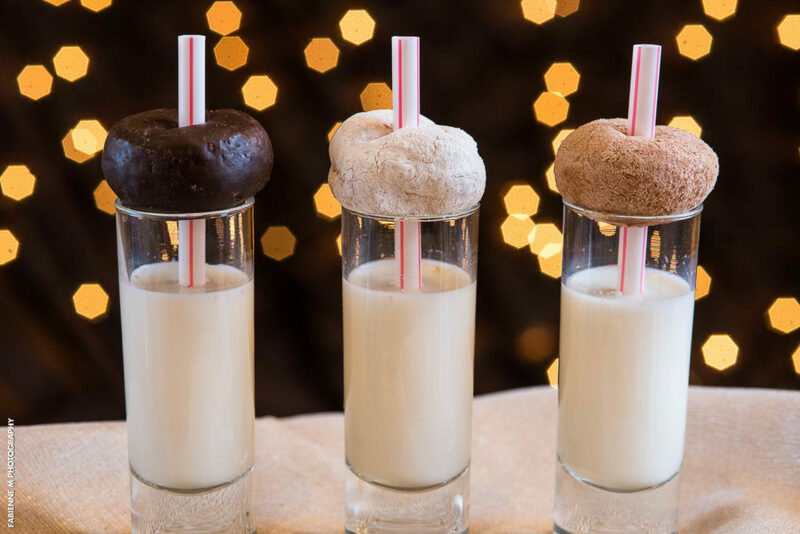 Donut wait to ask how you can add this hot new station to your wedding or mitzvah package! You can always choose desserts based on the season. 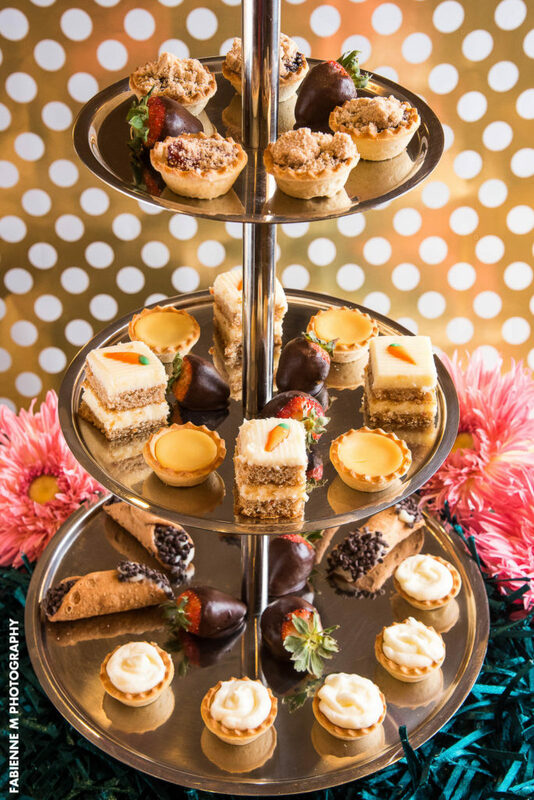 If you’re planning a spring or summer wedding, for instance, you could try the Spring-Summer Dessert Pedestal which is filled with treats like fruit tarts, chocolate covered strawberries, mini carrot cakes, and cannolis. Ask how you can upgrade your Dessert Pedestal (included in the Exclusive Package) to a Seasonal Dessert Pedestal. As you can see, there can never be too many treats for your guests to enjoy. Looking at all these delicious desserts offered at the Windsor Ballroom in New Jersey has made us a bit hungry. Hopefully, however, it has given you some inspiration on how menu options for your guests that their sweet tooth will thank you for. Check out our Accessories to view ALL our delectable dessert options.